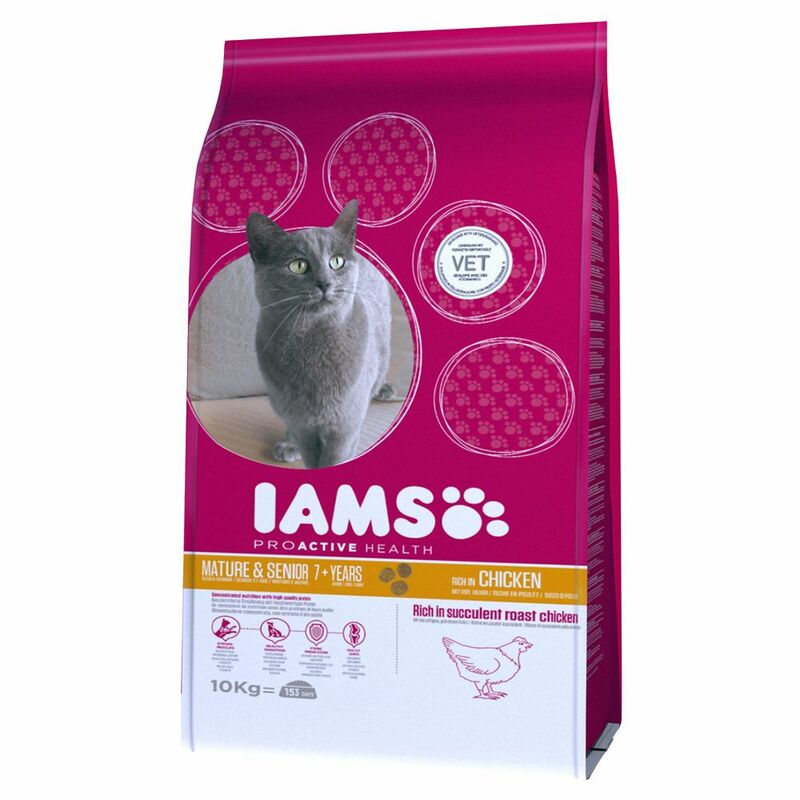 Iams Proactive Health Mature and Senior Chicken Dry Cat Food has been specially adapted to the nutritional needs of older cats, aged 7plus. Older cats are often leΒ active and can be more prone to illneΒ, so the recipe of this dry kibble has been formulated to help maintain strong muscle tone and a healthy immune system. This senior cat food includes 38% poultry meat, providing your cat with eΒential animal protein. It also has a moderate fat content, as well as l-carnitine that can help to increase your pet's metabolism to prevent exceΒ weight gain. Added antioxidants help to keep your older cat's immune system strong, even in old age. Special nutrients support the health of your senior cat's bones, teeth and joints, whilst the naturally occurring taurine in chicken and turkey help to keep your pet's heart and eyesight strong and healthy. The kibble has a special shape to make it easy to bite and chew, whilst the improved recipe makes it smell and taste delicious. Even the choosiest cats will enjoy this tasty dry kibble, and you can rest aΒured that they are consuming all of the nutrients that they need to enjoy a healthy old age. Iams Proactive Health Mature and Senior Chicken Dry Cat Food at a glance: Balanced dry food for senior cats aged 7plus Recipe with a nutrient profile that has been specially adapted to suit the needs of older cats 38% chicken and turkey: with quality animal proteins for a great flavour and aroma Strong, lean muscles: the food's moderate fat content, high levels of animal protein and l-carnitine all help your cat to maintain a healthy weight and good muscle tone, even if they are leΒ active as a result of advanced age Good digestion: healthy ingredients and prebiotics (FOS) create a balanced gut flora Strong immune system: rich in antioxidants and vitamins to boost the body's defences Healthy joints: ingredients to help to maintain joint health into old age With taurine: to helpt to maintain healthy eyesight and a healthy heart Healthy teeth: can support good oral health Omega fatty acids: help to keep skin and coat healthy Well accepted: tasty kibble with an improved recipe including lots of chicken and selected ingredients for a great taste Balanced and complete: all-round nutrition with vitamins, minerals and trace elements No added flavourings, colourings or preservatives Shaped pellets: flavourful kibble, designed with your pet's mouth shape in mind, making them easy to bite and chew.